The 2001 summer season was off to a wet start this spring with high water level in Koronis. It has been several years since we have had to worry about high water; I had taken it for granted that the lake would remain relatively constant. Flooding on the west end, along the Old Lake Road, and by the city park was a reminder that heavy winter snow and early spring rains can change the shoreline and landscape. In 1986 the lake rose several times during the summer from rains. I remember it well because I was eight months pregnant when the lake level rose, causing my dad¹s speedboat, just tied to the dock, to flip over. While my dad and husband were in the water struggling to right the boat, I stood on the hill with a rope tied to the boat and wrapped around a near tree, trying with all my might to steady the process. I strained so hard I thought I¹d give birth right there, but all that was delivered was the uprighted boat. This year as we crossed the inlet bridge on Highway 55 I thought how lucky we were that the bridge was built at a height safe from flooding. The original inlet bridge was another story. "The citizens are agitating the question of putting a bridge across Crow River at the inlet of Koronis. It is a good scheme and will be the outlet of thousands of bushels of wheat south and east of the lake," read the article in the August 2, 1894, issue of the New Paynesville Press. Professor Angus Haines, a prominent leader in the community, reported that the necessary funds had been raised. The bridge funding came from a number of sources including: Meeker County $250; State of Minnesota $225; Soo Line Railroad Company $100; Sawyer & Arnold Company $50; Osborn & McMillen Elevator Company $50; and the Atlantic Elevator Company $50. The total of $775 was available by the end of August 1894. Rafters and O¹Conors of Eden Valley built the original inlet bridge in the fall of 1894. It was completed by Oct. 15 and was 368 feet in length. "This bridge will not only be a great benefit to this place, but will bring those living south and east of the lake much nearer to our market," summarized the editor of the Press. In 1898 flooding occurred and the bridge was completely submerged. 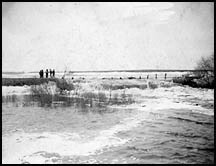 No text is available to describe the situation; however, one photograph (shown above) remains of water rushing over a barely visible bridge structure. Several men stand on the road surveying the impasse. As our summer season of travel to Lake Koronis begins, I am grateful that bridges leading to the lake are high and dry, causing no detours. The high water level in Koronis cannot dampen the excitement of a view from the lake. Information for this column has been taken from the New Paynesville Press, Aug. 2, 1894, Aug. 16, 1894, Aug. 23, 1894, and Aug. 30, 1894. Photo is courtesy of the Paynesville Historical Society.